“Little Technologies / Big Histories” is a workshop featuring on-going and in-progress research by UW students, fellows, and faculty. The workshop highlights the trans-regional, global, and “big” histories of small, portable technologies—including consumer goods, household items, and office machines—that changed the way people conducted their everyday affairs and left an imprint on daily life. Taking inspiration from David Arnold’s work on “everyday technology”, Tom Mullaney’s history of the Chinese typewriter, and recent scholarship in bureaucracy studies, the histories of science and technology, and print history, this workshop brings together scholars working on Asia, Africa, and the Americas to showcase the global travel of technology through imperial and consumer networks and the contributions of inventors, tinkerers, and designers who made these technologies meet local demands and individual needs. 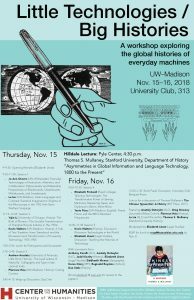 Hilldale Lecture: Pyle Center, 4:30 p.m.
RSVP for lunch to rsvp@humanities.wisc.edu by Nov. 8.